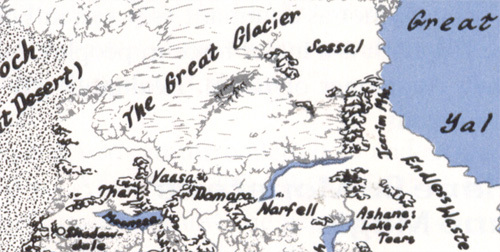 The region called the Cold Lands consists of the territories adjacent to or near the Great Glacier, namely Damara, Narfell, Sossal, and Vaasa. Their inhospitable climates are largely due to the glacier's influence. This collection of nations is erroneously called the Bloodstone Lands by many, but that title actually refers only to Damara and Vaasa. Sparsely inhabited but rich in mineral wealth, these lands draw foreigners looking to strike it rich quickly. Most, however, quickly become daunted by the hostile environment and aggressive tribesfolk. North of Impiltur and east of the Moonsea lies the once-mighty realm of Damara, now rebuilding from decades of war against its neighbors and the orcs and gnolls of the mountains. Tolerant of all races and most religions, the country is friendly to visitors, especially those who have skill in slaying monsters. Those interested in politics and adventure can find plenty of opportunities here. Damara maintains friendly relations with its neighbors and has a thriving gem trade based on its bountiful chalcedony (known as "bloodstone" for its red flecks) mines. However, the leaders of Damara keep a wary eye on the neighboring land of Vaasa and stay prepared for any strange threat that may arise from there. The hardy people of Damara have worked hard to rebuild their land. Although many are grim and bitterly lament the loss of their former way of life, the worship of Ilmater gives them strength in the face of hardship and high hopes for the future. Paladins of the Crying God, particularly from the Order of the Golden Cup) are a common sight, as are monks of that faith from the Monastery of the Yellow Rose near the Glacier of the White Worm. Despite the travails of their recent history, Damarans are proud of their country, which is home to peacefully coexisting humans, dwarves, halflings, and half-orcs. Their mines produce enough metals and gems to pay for needed repairs, and the svirfneblin colony under Bloodstone Pass has recently opened a school for illusionist magic. Damara's few roads are generally impassable in the wintertime, but rivers link the remote country with the capital. In warm months, keelboats and barges ply the cold, swift waters, and in winter, the river ice serves as a road for horse-drawn sleds and sledges. Bloodstone Pass: This is the only true pass through the Galena Mountains. Whoever controls Bloodstone controls the trade between Vaasa and Damara and can stop armies with ease. The pass contains Bloodstone Gate (large city, 13,233) a small forest, and a high mountain lake. Earthwood: This small, thick forest is amazingly resilient, growing back whatever is cut from it in only a few years. Legends say that long ago a great druid enspelled the wood in defiance of the glacier, and that since that time it has never been covered in ice. Monsters generally avoid the wood. Galena Mountains: These jagged, broken peaks are laced with ice and snow and inhabited by thousands of goblins and giants as well as other humanoid monsters. The residents of four major dwarven settlements - the Bloodstone Mines (village, 500), Hillsafar Hall (small town, 1,500), Ironspur (small town, 1,000), and a new settlement of gold dwarves, Firehammer Hall (hamlet, 300) - mine the Galenas for iron, silver, and bloodstone. Well-armed dwarf patrols keep the monsters at bay. The Underdark is close by, and the inhabitants of drow, derro, and duergar cities also mine deep veins under these mountains. The cities of Melvaunt and Mulmaster sponsor fortified mining camps in the western foothills. With a government still finalizing the bounds of its responsibilities after an invasion by the hordes of an evil lich, Damara is a land ideally suited for adventurers. The Gates: These two large fortress-walls guard the ends of Bloodstone Pass. The Gates contain stockpiles of food in case of an invasion and are regularly patrolled. The Damaran Gate is three miles long, thirty feet high, and studded with ballista-defended towers at regular intervals. A castle stands at either end. The Vaasan Gate is half a mile long and 60 feet high, with similar towers but no end castles. Many adventurers camp within the Vaasan Gate using it as a base for monster hunting within that land. Heliogabalus (Metropolis, 44,111): This is the old seat of Damara's throne, now reclaimed for the new monarchy. A prosperous trading city, it is literally the end of the road for merchants traveling north from other areas of Faerûn. Heliogabalus supplies all of Damara with foreign goods and is influenced by independent merchant guilds. Until five years ago the city had no army, only mercenaries controlled by the guilds. The new king ordered the guilds to disperse their mercenaries, and older paladins of Ilmater now lead young recruits in protecting the city. Trailsend (Large City, 14,116) This barony capital is built around a huge, heavily fortified castle. The city and barony maintain a friendly relationship with the nation of Impiltur. Baron Donlevy the Young (LN male human Ftr3/Rog3) who survived the reign of the Witch-King in hiding, leveraged that alliance to endorse King Dragonsbane. Now a wealthy, noble, Baron Donlevy is the king's primary liaison to Impiltur. As Trailsend is usually the first city that visitors to Damara see, several businesses cater solely to finding unusual employment for adventurers. Vaasa's Witch-King led armies of giants, goblins, orcs, and undead into Damara and eventually triumphed over King Virdin Blood-feathers at the Ford of Goliad. The fell creatures of Vaasa occupied northern Damara, but fled and scattered after the Witch-King's power was broken by a local band of adventurers. Gareth Dragonsbane was able to cement key alliances with lesser nobles through the support of the common folk, and was crowned king of Damara in 1359 DR. Since the unification of Damara, King Dragonsbane. LG male human Pal20/Clr5 of Ilmater) has worked hard to rebuild his nation's economy and strength of arms. Damara has recovered from the war with Vaasa and watches at the Gates to guard against future invasion from its northern neighbor. Trade relations with Impiltur are positive, and acceptance of the bloodstone tradebars is increasing. King Dragonsbane is trying to attract adventurers to his land by building upon Damara's reputation for adventuring. His agents cite mineral-rich mountains, proximity to monster-heavy Vaasa, the deep gnomes' school of illusion magic, and opportunities for land grants. Dragonsbane has even offered minor noble titles to folk of law and good who are willing to build homes and swear allegiance to Damara. These incentives are working, and there is now a steady flow of adventurers into Damara. Heroes can find plenty of opportunities in the monster-infested mountains and northern lands. Those who come here can earn prestige for themselves in the aftermath of this nation's political turmoil. Legacy of the Witch-King: Bandit activity in the Galena Mountains and northern Damara may be tied to the Citadel of Assassins, the evil organization that supported the Witch-King. Bolstered by spells cast by the evil, wizard Knellict (LE male human Wiz15/Asn4), the bandits have been hard to track and very effective in their raids. Capturing some of the bandits could lead to a break in discovering the location of the Citadel and rooting out the last vestige of Zhengyi's power. Underground Connection: Recently miners in the Earthspurs broke through to a previously unsuspected section of the Underdark. The large cavern they discovered contains an icy lake and is thought to connect to several known evil cities underground. Parties of adventurers are assembling to explore these areas and chart the myriad passages and caverns below. In addition to the riders, Narfell is home to tundra yeti (dire apes) and hordes of hobgoblins in the mountains. Ancient Narfell was a powerful, wizard-ruled state that was destroyed in wars against the now-fallen empire of Raumathar. The barbaric folk living here today remember little of their civilized past, but the Nars occasionally find buried cities within their land, each containing great items of battle-magic. This dry, flat grassland is home to vast herds of reindeer and wild oxen and the nomadic horsefolk who feast on them. The Nars move with their food, erecting "waymeets" (temporary tent villages) wherever nightfall finds them. They gather annually at Bildoobaris for a tenday-long Trade Fair to meet outlander merchants in a massive tent city. At the Trade Fair, the twenty-seven Nar tribes determine common policy for external matters such as wars and meet with outlander trade delegations. During the rest of the year, fast-riding messengers maintain communications between tribal chiefs as needed. The Nars are loosely united in a tribal council led by the largest tribe, Harthgroth. The Harthgroth, who can muster four thousand riders under the grizzled old warrior Thalaman Harthgroth (N male human Bbn5/Ftr11), regard outlanders as sources of trade-wealth rather than foes to be robbed or slain. Other tribes are far more hostile-notably the Creel, who attack outlanders and other Nars on sight. The Var tribe, however, welcomes outlanders, and its people strive to become more like them. The Dag Nost are as civilized as folk in Impiltur. Nar tribes don't use badges, uniforms, specific colors, or identifying banners. An outlander who doesn't look like a Nar - tanned skin, long black hair braided in a horsetail, gaudy clothes, superbly skilled at riding - always travels in peril. Nar horses are tall, tough, strong, and can endure great hardship. They are the chief wealth and primary trade-goods among the Nars, who love to barter and buy, having a weakness (the men in particular) for jewelry and bright-colored clothing. The flat plains of Narfell boast few features of note. More lies under the surface, however, including remnants of the ancient empire that once thrived here. Icelace Lake: Formed of runoff from the Great Glacier, this lake boasts pure water and plenty of fish. The water is so cold that it can kill a swimmer within 10 minutes. Home to unusual aquatic creatures, the lake is also known for the aggressive dire bears that live on its shores. The "cities" of Narfell consist primarily of simple towns where the nomads congregate. Bildoobaris (Metropolis, 33,048, summer only): For a tenday each summer, the tribes of Nars gather to form a massive tent city. Miles of animal-skin tents cover the land, and the natives welcome merchants from other countries for a brief time, exchanging horses- and items taken from ruins for clothing, jewelry, dried meats, weapons, and quality barding. The country of Narfell dates back nearly as far as the Orcgate Wars that broke the back of Mulhorand. The mercenaries who were hired to fight the invading orcs established the nation of Narfell. Both they and their enemies from Raumathar claimed portions of Mulhorand's northern empire. Eventually these two nations went to war, and while both asked Mulhorand and Unther for aid, neither country gave it, fearing prophecies that such a war would end in mutual destruction. The last battle between Narfell and Raumathar involved demons, dragons, and great magic that burned entire cities: When the smoke cleared, both nations were dead, their people scattered into small tribes and enclaves on the blasted land. Narfell has survived ever since in this form, greatly humbled and ignorant of its former glory. Certain legacies remain in the great weapons and heroic names some of the Nars carry, which date back a thousand years to the great kingdom of Narfell. Adventuring in Narfell means dealing with the native tribes. Assuming that the heroes encounter Nars who don't simply attack them outright, they may still have to "prove" themselves to win a fair hearing. Staking a Claim: King Gareth Dragonsbane of Damara has established a friendly relationship with Thalaman Harthgroth, obtaining permission for the people of Damara to mine the Narfell side of the Giantspire Mountains in, exchange for a tithe of gems and jewels. Now the barons of Damara need people to find suitable mining locations and secure these areas against attacks by hostile humanoids. This untamed wasteland of frozen moors and tundra was the seat of power for the evil lich Zhengyi the Witch-King until his defeat by a band of adventurers. Vaasa is once again a lonely land dotted with scratch farms and inhabited by evil humanoids and other monsters. What the land lacks in hospitality it makes up for in untapped wealth, as the mountains of Vaasa are rich in metals and gems, particularly bloodstone. Miles of mountainside go unclaimed by any civilization, and many well-armed prospectors make the trip to Vaasa hoping to find gems as large as a grown man's fist - and survive long enough to sell them. Vaasa is a cold, dreary place with poor soil, inadequate, for large settlements without magical help. During the brief summer the frozen earth turns to thick mud, making travel more difficult than it is in the wintertime, when dogsleds and skis are a common sight. Numerous bands of humanoids hunt the plains and mountains in search of game; mainly caribou and small herbivores. Other humanoids resort to consuming the dead of enemy tribes. Local settlements of humans are well protected or in isolated places where they are likely to go undiscovered. Life is hard and the people are tough, quiet) and stern. People of the flatlands speak a mixture of Common and Dwarven, while the inhabitants of remote mountain settlements (and those close to Palischuk) use many Orc words. Bordered by mountains and the Great Glacier, Vaasa is virtually isolated from the rest of Faerûn. Bottomless Bogs: These large, sometimes hard-to-spot areas of mud and rotting scrub plants are deadly traps for the unwary, for they can drag even a strong person down with a grip as powerful as a giant's. A few form around hot springs, which some say are fed by a magical source. Water from these springs can reputedly enhance abilities, heal wounds, or grant even more powerful magic. Great Glacier: Formed from the magic ice necklace of the deity Ulutiu, this glacier has been consistently retreating for centuries. Until three hundred years ago, it covered Damara and Vaasa. Tribes of humans (Ulutians) live in the remote parts of the glacier, occasionally traveling to the "hot lands" for meat and iron weapons. Within the territory covered by the glacier is the Novularond mountain range, a region said to hold lost cities strangely free of the ice. The Glacier is home to white dragons, remorhazes, snowflowers (edible plants that tumble about in icy winds), iceflowers, ice worms (white-furred things as long as a man's arm that live on meltwater and snowflowers), "ghost" or White rothé, and even roaming gelugons. these are the "Icy Claws of Iyraclea," servants of the ancient and mighty human priestess who styles herself "the Ice Queen." Iyraclea (NE female human Clr15/Dis5/Hie5 of Auril) is the mistress of the Great Glacier. From her realm beneath the ice she spell-snatches young, vigorous mages for some unknown but doubt less sinister purpose. Iyraclea worships Auril the Frostmaiden and commands magic of awesome power, including spells of her own devising, such as icerazor, icefist and cold claw's. Few see her castle of sculpted ice and live to tell the tale. Despite its hazards, Castle Perilous is the most impressive and visited site in Vaasa, a land now largely empty. Castle Perilous: Vaasa became a cauldron of evil decades ago when, through the labors of demons, a dark stone fortress arose in a single night. The Castle Perilous on the shores of the Lake of Tears was the seat of the lich Zhengyi, who styled himself the Witch-King of Vaasa. With the aid of his demons, he assembled hosts of dire wolves, giants, goblins, orcs, and undead to conquer Damara. The ironbound castle is a crumbling ruin today, roamed by lurking monsters and hopeful adventurers seeking Zhengyi's magic. The castle collapsed when Gareth Dragonshane led heroes into Vaasa to break the lich's power. Dragons often lair atop Castle Perilous, only to be slain or driven out by adventurers or a lurking, terrible something that evidently feeds on things even as large and powerful as great wyrms. Darmshall (Small City, 5,333): The Tenblades adventuring band founded this fortress-village in southwestern Vaasa, hard by the southern Galenas peaks. It withstood Zhengyi's rise and fall, and today it is the center of a small but growing territory of farms and cattle ranches. Walled Darmshall boasts huge underground granaries, armories, and a weapons-muster of almost five hundred capable soldiers, under the rule of the a tireless warrior Gelgar Talonguard (LN male human Rgr15 of Helm). Women are few in Darmshall, and Gelgar has sent recruiters to the Dragon Reach, Telflamm, and Impiltur, seeking wives for the men of Darmshall. Delhalls and Talaghar: Recent melts along the edge of the Ice Run glacier have revealed these two longfrozen dwarven mines that hold rich bloodstone, emerald, and ruby deposits, as well as some work able iron and copper veins. Palischuk (Small City, 9,211) This town to the east of Castle Perilous is a larger but less grand fortress, a ruined city rebuilt by half-orcs. The half orcs worked hard to befriend nearby settlements and succeeded. They trade peacefully and honorably with Bloodstone Gate, Darmshall, and neighboring dwarves, though humans continue to regard Palischuk warily. For most of its existence, Vaasa has been a frozen land barely capable of supporting civilized folk. For centuries nothing more than humanoid tribes and scattered hunters, trappers, and farmers inhabited the land. The arrival of Zhengyi and the creation of his fortress in 1347 DR turned Vaasa into a military nation of goblinkin, orcs, giants, undead, demons, bandits, and skilled assassins, all intent on conquest. The armies of Vaasa attacked and defeated the people of Damara, dividing that nation into petty baronies. The so called Witch-King disappeared for a time, and a group of heroes rose to defeat the demonic minions and eventually the lich himself, which caused Castle Perilous to collapse. The Vaasa of today has reverted to its old ways, with bands of monsters running loose and no central authority. However, bandits and assassins are still thought to be hiding somewhere in the country, plotting revenge. Great magic means great treasure - adventurers hope, anyway. The Witch-King may be gone but his works still remain, from the ruins of Castle Perilous to the creatures that served him. Monster Hunt: King Dragonsbane of Damara is concerned with the large numbers of humanoids that live in the mountains and plains of Vaasa. He has increased the bounty on goblins, bugbears, and giants to 5 gp, 15 gp, and 200 gp respectively in hopes of convincing adventurers to stake claims here. Increased numbers of these humanoids have been gathering around the ruins of Castle Perilous, perhaps in service to some newly rising evil power. This remote realm far to the north of Narfell has little contact with the rest of Faerûn. Once or twice a year (generally in the summer), visitors from Sossal arrive in Damara, bringing furs, seal meat from the Great Glacier, beautiful items of shaped wood, and, gold. They leave with dwarven weapons, silver, and various kinds of meat to trade with the people of the glacier. Some Sossrim have natural powers akin to druidic magic and can bend plants to their will, pass through growth impenetrable to others, or even transport themselves from one tree to another. In fact; the ornate and smoothly shaped Sossar furniture sold so steeply in Sembia is not carved at all, but sculpted by the minds of Sossrim "carvers." Sidebar: Glacier of the White Worm.